Corabelle "Corky" (Emmons) Jedlicka, 93, of Columbus, died Sunday, October 22, 2017, at Bryan LGH in Lincoln. Funeral Service Wednesday, October 25, 2017 10:30 A.M.
Visitation Tuesday 4-7 P.M.-- Wednesday 9-10:30 A.M.
Mrs. Corabelle (Corky) Jedlicka was born January 8, 1924 in Silver Creek, NE to Chancey and Edith (Younger) Cremeen. She graduated from Silver Creek High School in 1941. She married John "Floyd" Emmons on June 20, 1943. To this union Ronald and Dennis Emmons were born. Floyd passed away in 1973. Corky married Donald F. Jedlicka on December 28, 1976. She has three step daughters: Nance, Linda and Amy. After high school, Corky worked several years at the Grand Island Bomber Plant during World War II. Most of her life was spent being a caregiver in one way or another. She cared for her ill son Dennis for 15 years, cared for older couples, conducted sing a-longs for the elderly at the Good Samaritan Home in Osceola, and helped many couples manage their businesses when one of the owners were ill. Corky just seemed to always be there when someone needed something. In Schuyler she was secretary for Don's Feed Service for many years and worked at the Top Notch Café for several years. Corky was also very active and held many offices in her church. 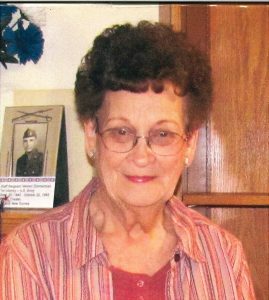 She was a member of ARC Colfax County where she held the offices of President and Secretary through the years and was a State Representative in Lincoln. She was also on the Executive Board for Region IV in Columbus. Corky was Vice President of the Beulah Cemetery Association south of Silver Creek, NE where her parents and grandparents were buried. Retiring with her husband on the farm she enjoyed camping, fishing, dancing, playing cards, yard work, music, reading and much more. She was a member of the Victory Christian Fellowship in Columbus where she renewed her vows as a born again Christian and was baptized as an adult in Wagner Lakes. Survivors include her husband, Donald of Schuyler, one son, Ronald Emmons of Osceola, NE, stepdaughter: Amy Heavican of Omaha, Linda Rhoades and Nancy Jedlicka both of Lincoln, NE and a special friend, who was like a daughter to her, Margie Waller of York, NE Corky also had one granddaughter, Angela Emmons of Lincoln and three step grandsons, Colin, Joey and Nathan Heavican of Omaha. Special friends Lloyd and Betty Brichacek, Darlene Mastera, Sharon Bates and many other relatives and friends. She was preceded in death by her first husband, Floyd Emmons, one son Dennis Emmons, one step daughter, Gail Jedlicka, three brothers, Melvin, Clarence and Chester, one sister, Alice San Filippo, sisters-in-law, a brother-in-law and her parents.